Pip and Pooch, the fun new primary schools touring show from Terrapin Puppet Theatre, is a wonderful child’s-view story about friendships and man’s – or, in this case, girl’s – best friend. For Pip, life is not easy as she negotiates the difficulties thrown up by a bizarre array of family and foe as her birthday party approaches. But when Pooch arrives things begin to improve. The energetic engagement of actors Bryony Geeves (Pip) and Matt Wilson (Pooch) had the children in the audience enthralled and laughing right from the start, with their clever silliness, heartfelt real-life reflections and crazy puppet characters. I particularly loved the two-dimensional cut-out puppets with their simple choreography of arms and legs, and smiling / frowning magnetised faces which were removed like layers to reveal their changing emotions. It’s amazing how engaging a talking puppet without a moving mouth can be! seamlessly combines the two- and three-dimensional worlds of photorealism, live characters and magazine cutout animation, to create a somewhat surreal yet warmly familiar visual world. 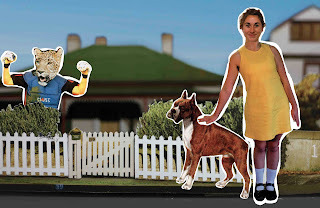 The horizontally layered set skillfully allows for the various perspectives and elements of the story to blend smoothly on stage, moving from mini street scape with characters at front, through Pip’s cut-out full-scale girly bedroom, to a projected streetscape at back of the mini set at the front ( as well as doubling as an animation screen). Its quite a treat to see. This technically complex show is full of delights and enormously engaging. Terrapin’s new Artistic Director Sam Routledge has managed to strike a beautiful balance between the multimedia gadgetry, live action and much wonder-filled puppetry . I look forward to seeing more of his shows.